Located minutes from the McCarran International Airport in Las Vegas, we are a low-cost, all-inclusive executive suites facility that provides office solutions for any business. 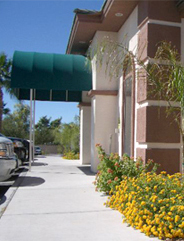 It is the mission of Airport Executive Suites to allow clients to focus on developing and growing their business by providing the latest communication tools, flexible office space, meeting facilities and administrative support in a pleasant, productive, professional environment for your business in Las Vegas. When looking to lease Las Vegas office space, Airport Executive Suites is the answer to your office space needs!